Xander Phoena, the host of Crossing Zebras, one of the foremost podcasts in EVE, came to me with a great idea. A community FFA featuring the CSM, the podcast community, bloggers and best of all YOU, the public! So join us on 5th October 2013 from 20.00 EVE in the system of Asakai. Bring frigates, destroyers or even cruisers and meet us at the Sun. Do not miss out on a killmail of your favourite CSM members, or podcast hosts! What we would love from you is people to stream the event live & in person, so if you use Twitch and stream ganked, or solo roams or indeed anything, drop by the system and get the coverage rolling. We will have some prizes to offer, including random contracts of Slicers & Firetails from me, courtesy of Judontknowme a former RvB Ganked regular, as well as other items to be arranged between now and the 5th October. Check this post out over on the Crossing Zebras site for more details, or to ask any questions join the ingame channel CZ Community FFA. If you have your own ideas, feel free to post them in the comments. Not really too much to say on the CSM, except that the past 3 weeks or so have in my opinion been really good for our interactions with CCP, I cannot say on what subjects, but I have felt like I have been contributing a lot more. Additionally the summit dates are the 28th to 30th August, I will not be “live”, but I will be there remotely due to work commitments. Also, please join me on the EUNI public mumble on the 13th as per this post on their website. Now in my defence I had 2 guys giving varying intel, 1 guy rehashing a fight some slackers had just had, and a few other people continuing to sing – after an admittedly great fleet wide rendition of Bohemian Rhapsody – and someone else calling a cheetah on a gate as primary, just to see our own bubble go up as some bombers decloak while half the fleet is warping into our bubble and the other half is jumping away from the bombs, no wonder I was annoyed. Anyway, I soon calmed down and we reformed around half the fleet in Stacmon – usual after a whelp – and went and fought an Agony Empire PVP Basics roam. Welcoming newbs to pvp always feels good. Ganked 69 was held this weekend, and it was a glorious 5 hours in Rahadalon fighting the forces of Brave Newbies Inc, TEST, CVA & Friends, and many others who I forget at this point. Suffice to say the system was rammed. I had plenty of prizes to award over the evening from both SomerBlink and the wonderful guys over at Angeli Mortis. The above will be contracted out by a rep of SomerBlink this week. In RvB news, we are at war with Brave Newbies Inc. Despite appearances to the contrary we have done this for fun, and boy has it been fun! The BNI guys really are mostly a great bunch and the fights I have had with them have been bloody good ones. We have a few days left in the current war period and I am hoping for even more explosions before it comes to an end, although it may not end – watch this space! For those wondering, RvB are closing in on 2000 kills in 5 days, including a couple of freighters and a rather shiny strategic cruiser. Neither side has lost carriers yet despite RvB moving a couple over. I have hope for a sweeping capital engagement though! Good thing about this war, I get to stop losing sec status from spending time in Rahadalon. Which is good as I am far too lazy to rat to get my sec back up. So roll on Odyssey! As you will be aware, I have been a member of the 8th CSM for around 3 weeks now, and for the majority of that period I have spent a lot of time reading super sekrit CSM forums, getting to know both my fellow delegates (many of whom have vast knowledge on parts of the game I only have the most basic conceptual grasp!) & the members of CCP to whom we currently have access, and digesting much of the material released about the upcoming expansion than I normally would, especially anything relating to the changes and additions that I am not very confident on. I would sooner be able to represent you all by understanding how everything fits together than just spouting something because I feel a need to be seen to do “something”. All of this just ends up with a very quiet Mangala, not the person you are all used to I know. However, as time goes on I hope to become more vocal, especially if anything happens in the content area’s to which I have concerns or hopes for change. And that guys is the first News Round. Not much to say, but lets hope I can improve that over time. 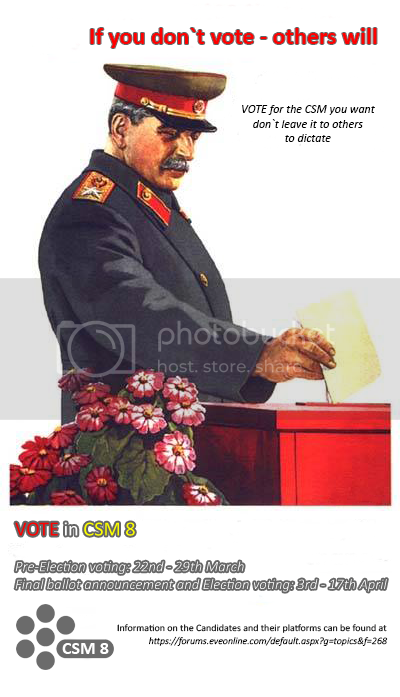 Voting has now started for the 8th CSM and runs until the 18th April 2013. After this simply click the Submit Vote button and you are done. Congratulations you have now voted for the 8th CSM. Mangala Solaris; Ripard Teg; Ali Aras; Malcanis; Trebor Daehdoow; Nathan Jameson; Mike Azariah; Psychotic Monk; Corebloodbrothers; Unforgiven Storm; James Arget; Mynnna; Steve Ronuken; Roc Wieler. Every vote matters, so please do not waste your vote by not voting or just picking 1-14 random candidates. As with many other Candidates including Trebor, Ripard and the oh so obvious Bloc members, I am going to provide a list of recommended candidates and here we are! 1. Mangala Solaris – Well you all know me, are all supporting me, and I would relish the opportunity to represent you on the 8th CSM. 2. Ripard Teg – Very experienced in EVE. Understands many different aspects of the game and its mechanics. Is a damn prolific blogger too so no worries on potential lack of communication! 3. Ali Aras – very focused on the experience of new players in game. Which is something the CSM really needs, new players are important to EVE (and to us in RvB!). 4. Malcanis – While in a null bloc, Malcanis is not officially a bloc candidate as far as I know. I have chosen to recommend him as he has been around EVE for a long time, knows his stuff really well, knows how to put across an excellent argument and has pretty good opinions/ideas on all aspects of EVE. 5. Trebor Daehdoow – When it comes to CSM experience, Trebor is the man here. Has a strong presence in anything CSM related and with CCP Xhagen no longer working on CSM things he will be especially needed by CSM 8. Additionally while his ideas on certain aspects of the game arent to my own tastes, he argues their points well as both devils advocate and actual advocate. Also he makes Poetic really mad. 6. Nathan Jameson – Nathan is the first of my 2 WH picks for this ballot. He is very well grounded in WH’s and in Talocan has founded one of the largest & most stable WH alliances. 7. Mike Azariah – Casual players (and by that I don’t mean bad players which some equate Casual with) need a voice too. Mike would make an excellent rep for people who play as casual and have tried varying aspects of EVE, never finding a single niche. Future expansion releases could give this type of player even more to do, so CCP need some guidance from players such as Mike. 8. Psychotic Monk – A candidate who is for a better “alternative lifestyle” highsec. He has solid ideas, doesn’t have the rabble rabble nonsense that James 315 did and with belligerent undesirables is teaching people to get out and create their own stories in EVE, which is something that drives people to play this game in the ways they do. 9. Corebloodbrothers – Provi guy, who like me wants to see the game keep evolving, and even though he is Provi, has a solid love of PVP. 2 excellent reasons to list him in my book. 10. Unforgiven Storm – Another guy who while in a bloc, does not have the official bloc representative tag. His main platform is industry and improvements to all its forms. He has a solid industry background to support him and the CSM in general in this endeavour. 11. James Arget – my other WH pick. Probably the most likely to get onto CSM out of the WH groups due to his broad appeal amongst those groups, and I think he is the most knowledgeable of the WH candidates when it comes to the actual mechanics of them. 12. Mynnna – Yes the CFC’s main candidate gets a recommendation from me. The guy has a very solid grasp of what the CSM is and should be doing during its term, backed up by a wealth of game knowledge. 13. Steve Ronuken – Totally a “little fish” in the CSM 8 Candidate pool. I like the guy’s perspective on war decs, non-consensual pvp, & his view of null is similar to my own. He would also be a valuable candidate for the 3rd party app community to have representing them on the CSM. 14. Roc Wieler – He wants the 8th CSM to be the best it can for as many as it can and will work to make it happen, and is a very strong voice in the community overall. Please note, this listing is not in any particular order after the top spot! Voting that requires a list such as this should start on the 4th April. When it does I will send a mail around, and edit this post with a link that “should” let you just click it, login and vote – either by following my recommendations or voting your own way. After a short – and increasingly worrying – 4 day wait, the Pre-election for the 8th CSM has opened. I am an officially listed Candidate and can be Endorsed by following this link and clicking the big yellow Endorse button once you have logged into the site. In a week CCP will then open the second part of this Election cycle and allow everyone to list their preferred 14 candidates. The winners of this section will go on to form the 8th Council of Stellar Management. Thanks in advance to everyone who endorses me, and I hope I win enough of your support to advance to the second phase next week.